Amino acids are the building blocks of protein, used by the body to grow and repair tissue, break down food and carry out many other bodily functions. Of the 21 amino acids, nine are essential, meaning they must be obtained from the diet. These nine are leucine, isoleucine, lysine, tryptophan, histidine, phenylalanine, valine, methionine and threonine. While protein sources such as meat, eggs and dairy are good sources of amino acids, vegetables can also help you meet your daily requirement of these essential nutrients. 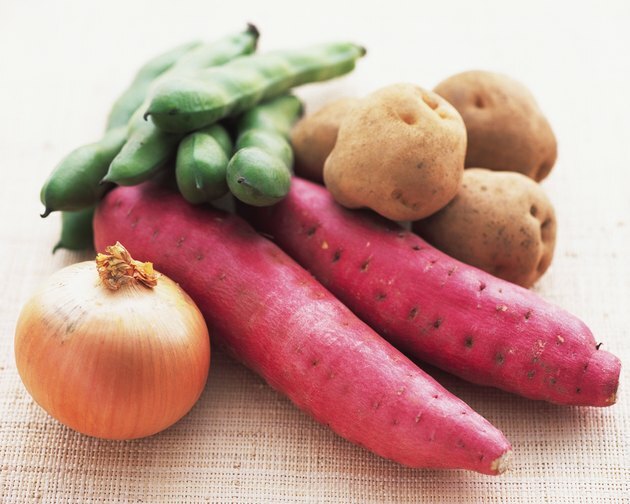 Starchy vegetables such as white potatoes, corn and sweet potatoes are good sources of amino acids in the diet. Like a majority of plant-based foods, starchy vegetables are considered an incomplete protein. An incomplete protein is a food that is lacking one or more of the nine essential amino acids. Starchy vegetables do not contain the amino acid lysine, which must be obtained from another food in the diet. Beans and legumes are a good source of vegetable-based amino acids. Some examples of these foods include black beans, kidney beans, peas, lentils, garbanzo beans and peanuts. Beans and legumes contain high levels of the amino acid lysine but do not contain methionine. This is why it is often recommended to consume beans with rice, since grains are high in methionine. This is known as a complementary protein, since each food supplies the amino acid the other lacks. These two foods do not have to be consumed at the same time, but eat them within the same day to reap the benefits of complementary proteins. Leafy green vegetables are sources of a variety of nutrients including amino acids. These vegetables include spinach, kale, romaine, Swiss chard and broccoli. Leafy greens contain higher levels of the amino acids leucine, lysine, phenylalinine and valine. Eating these vegetables along with vegetables that contain higher levels of other amino acids, such as beans, legumes or starchy vegetables, can help you meet the daily requirements for each essential amino acid. While a lot of vegetables are considered incomplete proteins, a few plant-based foods are exceptions to the rule and are complete proteins. Soy can be found in a variety of forms such as whole soybeans, tofu, tempeh, miso and soy milk. Quinoa, a gluten-free pseudo grain, can be eaten and prepared similarly to traditional grains such as rice and barley. Can Certain Vegetables Increase Your White Blood Cells?